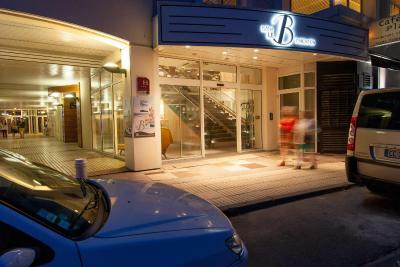 Lock in a great price for Hotel Le B D'Arcachon – rated 9.1 by recent guests! The hotel was clean and nice, as in the pictures and is very close to the beach. Location is great. Rooms are cheerful. Balcony was spacious with a nice view. We were first given a room next to the elevator. I asked to be given another room and they obliged. The elevator doors slammed when closing, metal to metal. The breakfast buffet was excellent. The wifi was OK sometimes then be snail slow a few minutes later. The room was exaclty as in pictures. So what you see is what you get. Location was very convinient for beach vacation and walking in centre. We did not have breakfast in hotel because there is no outside sitting option and there is plenty of nice cafes around hotel. Lovely hotel with smart, professional and welcoming staff. Good location and well-sized rooms with good wi-fi and a first class bathroom. We were given an upgrade & the room is really lovely. Big bed, big shower, tea & coffe making facilities. The bathroom is lovely, very up to date with a separate toilet. Very friendly and helpful staff. Lovely breakfast. I think it must be one of the best located hotels in Arcachon as it’s right on the beach & in reach of shops, bars & restaurants. We’re enjoying so much we’ve booked an extra night! Paid to upgrade to a sea view room. It was worthwhile. Large balcony, lots of light. Very comfortable bed. Very helpful staff. One of our top picks in Arcachon.Located by the Arcachon Bay, this hotel is beside Casino de la Plage and offers direct access to the beach. It has air-conditioned rooms with a TV and free WiFi access. 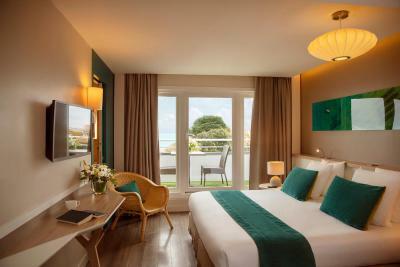 Each guest room at Hotel Le B D'Arcachon is equipped with an LCD TV and an private bathroom. Some rooms feature a balcony. A smartphone is provided in each room. A buffet breakfast is served every morning at Hotel Le B D'Arcachon. There are many restaurants and cafes within walking distance. Private parking is available on site at an extra cost. Arcachon Golf Course is a 12-minute drive from the hotel. 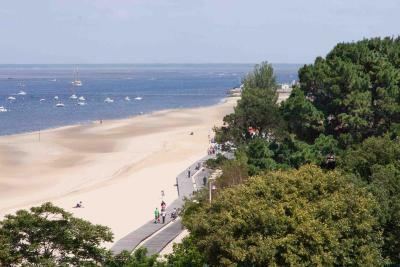 Arcachon Train Station is just 1,000 feet away and boat rides leave directly opposite the hotel. 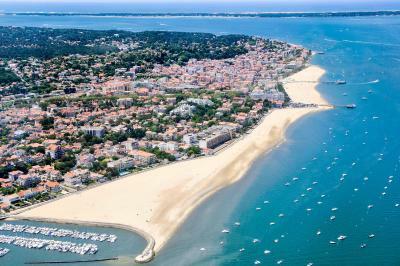 This property also has one of the top-rated locations in Arcachon! Guests are happier about it compared to other properties in the area. 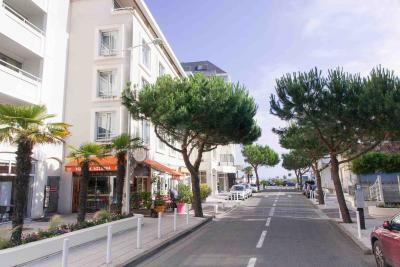 This property is also rated for the best value in Arcachon! Guests are getting more for their money when compared to other properties in this city. When would you like to stay at Hotel Le B D'Arcachon? A flat-screen TV with satellite channels is featured in this air-conditioned room. 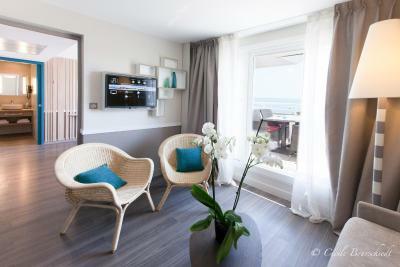 Offering views of the Arcachon Bay, this air-conditioned room features a flat-screen TV. This room is on a high floor and features air conditioning. There is also a fridge at guests' disposal. This suite has cable TV, sea view and air conditioning. House Rules Hotel Le B D'Arcachon takes special requests – add in the next step! Hotel Le B D&#39;Arcachon accepts these cards and reserves the right to temporarily hold an amount prior to arrival. Hotel Le B D'Arcachon accepts these cards and reserves the right to temporarily hold an amount prior to arrival. Please let the property know if you are coming with children using the Special Requests box when booking. Please note that when booking a Breakfast Included rate, breakfast is not included for children older than 7. The only problem we encountered with our stay was finding and using the garage, which was only a short walk away but not evident. We did not like the choice of music at breakfast, something quiet and calming would have been preferable. Perfect location and lovely room. Lighting in rooms a bit dim - why not brighter - OK for summer but not for winter. Nice hotel very well located and close to the beach - you can see the beach and sea from some rooms. Next to a nice cafe and the best restaurant in Arcachon (and the most expensive). Very modern and welcoming Breakfast was good. Location almost on sea front. Perfect location for visiting Arcachon. Very helpful friendly staff. We had booked a basic room and were upgraded to a room with sea view and balcony for no extra charge.